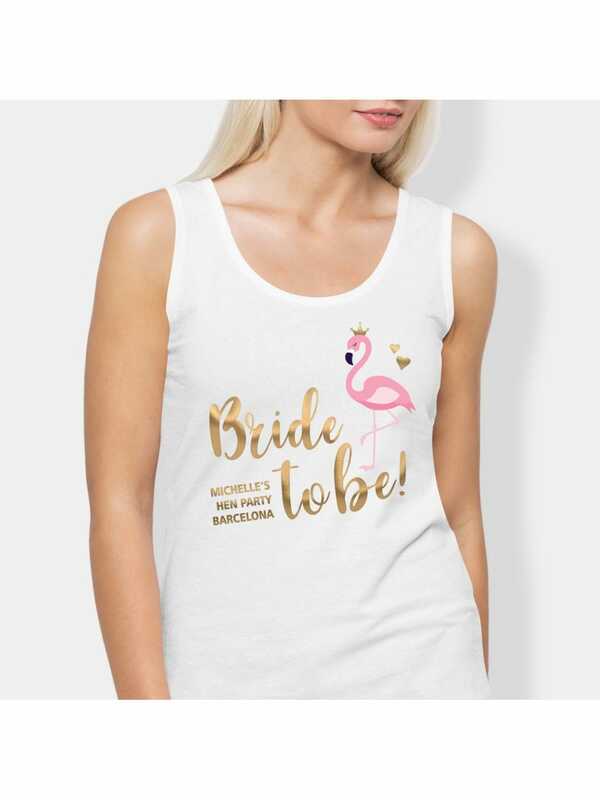 Available in black or white, this fun flamingo vest top is a fabulous gift for the bride to wear at her hen party. Dress this vest top up or down for casual or evening events – black and white will go with anything. The flush-pink flamingo adds a pop of colour to the vest top, a fun-filled motif for tropical hen parties. Gorgeous gold foiled text in an irresistibly twirly font won't leave the bride unnoticed. There's room for more golden text should you want to customise your vest tops with a title for your hen party event. This personalisation service is free of charge. Give your vest tops a personal edge for fabulous photos and to elicit a team atmosphere. Find matching products from our Bride's Flock range. Bought this for a friend for her hen do as she loves flamingos and she adored this top. Good quality, good value for money, neatly packaged, arrived within 48 hours of ordering. My friend usually wears a small but the medium I ordered fits her perfectly.